As some of you may know, PADI has announced the introduction of a new or rather extended version of the Open Water diver course, now it can be taught using dive computers and the RDP Table or eRDPML becomes optional if you opt teaching the Open Water diver course with a dive computer although you can teach both the computer and either or both versions of the RDP tables. Currently there are no plans to integrate the computer option into eLearning. PADI will print a new exam in late 2009 or early 2010. For now there is an errata (free download from the homepage of padimembers.com). The most current PADI Open Water exam has a revision date of 2008. Exciting for an instructor is that there will be a new revised version of the Prescriptive Lesson Guides, this product has undergone drastic changes and will be released towards the end of this year. 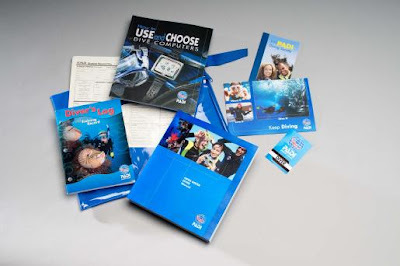 There will no new Open Water diver course Instructor Guide, however, PADI will release a completely new (streamlined) instructor manual in 2010. Instructors who renew before the end of 2009 will receive a CD version of the new instructor manual for free with their first quarter 2010 Undersea Journal in the USA. You can find more information on teaching the computer option if you reference the third quarter 2009 training bulletin. Good to know is that the Open Water diver manual and DVD have not changed. PADI Standards require all Open Water students to own a copy of the Open Water Manual. Computer students must complete knowledge reviews 1-3 from the OW manual, but are not required to complete 4 and 5. In lieu of knowledge reviews 4-5 from the Open Water manual, the computer student completes two knowledge reviews from the How to Use and Choose Dive Computers manual. Answers to these knowledge reviews can be downloaded from the PADI Pros site. What is the Dive Simulator? The Dive Simulator is a generic dive computer used to illustrate some of the topics discussed in the How to Use and Choose Dive Computers manual. The simulator is a free download (access information can be found in the Computers manual). Students are not required to use the Dive Simulator. How does PADI address variety of dive computers on the market (and differences in dive planning calculations)? The How to Use and Choose Dive Computers manual discusses general computer use and refers students to their users manual for specific details. Please look in this article which includes sample pages. Quiz and exam questions are worded to address general computer usage rather than specific scenarios. All in all an exciting new development in the Open Water diver course and a perfect way for you as an instructor to get your Open Water student accustomed to dive computers at the earliest possible stages. All information from this post comes from this very useful PADI USA North Western blog, thanks for the info!